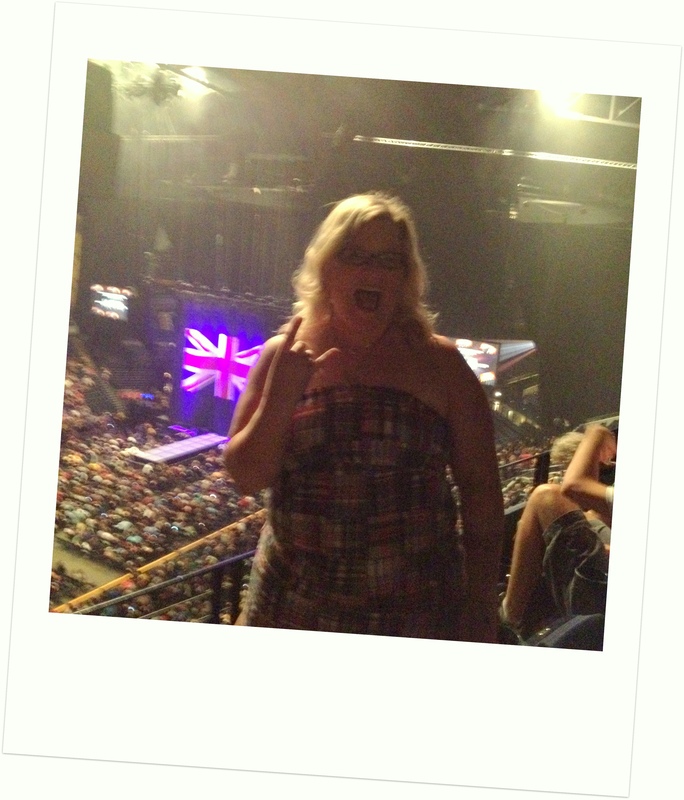 I had an excellent reason why I didn’t blog this past week. . .it’s called Def Leppard and The Rock of Ages Tour. Money well spent and I will already say, I can’t wait to see them again. For those of you scratching your heads as to why I am so old school when it comes to concerts, well; if I am going to spend my money on a show I am going to hit up the acts that I really want to see. At one point, I had a small interest in seeing Van Halan, but after talking to Hooch, I am so glad I didn’t. Seems Roth’s voice is shot. No thank you. And as much as I liked Lita Ford growing up (seriously loved the girl rockers of the 80s) she didn’t sound too hot opening for Def Leppard. Poison? I did enjoy their set but I would give my eye teeth for someone to pull Brett Michaels’ weave off his head. Dude, let it go, your hair is gone, it isn’t that big of a deal. The people watching was top notch. The neon colors of years past is back, as is the skimpy ho dresses. To keep with my, I so don’t look like someone hitting a Leppard concert, I wore capris and my madras dress which is still being used as a long shirt. I got Stace to take this picture with the British flag in the background. While it would have been nice to have gone to the Atlanta show, I am kind of glad I didn’t. The heat would have killed me! Overall, it was worth the time, money and drive up to Nashville. I also got in one last visit with Sonia and her family. They are heading up to Baltimore at the end up the month for a job. I will miss them but that just means I can visit and we can hit up all the great places in DC. And NYC. I have been hiding indoors most of the week although I did manage to hit the pool for a bit today. And the one time I don’t take my phone with me, my parents blow it up about meeting for lunch. I looked a little rough but that’s okay. Hopefully I can get back on schedule and maybe, just maybe, we will get some rain. . . I have shared random moments on a Tuesday 52 times. . .and some of you are still here reading this! I ended up taking a small vacation from writing last week, some days you just don’t feel like writing. Plus, I was up to my eyeballs in cleaning supplies trying to prepare my place for Hooch’s visit. But here we are, Tuesday again and in a week’s time I will be rocking it out in Nashville at the Def Leppard concert. I finally cleaned Wookie’s bathroom, not his litter box (that is done often) but the actual bathroom, I don’t use the toilet in there, so it gets icky by not getting used, who knew? The more I think about it, the more I want to relocate to the Baltimore area or the Kansas City area. . . I will be heading to see The Trousdale School’s musical this Saturday, I am quite excited! I am hoping that Bird and I will get to see Magic Mike Friday, I like me some eye candy! And since I still feel like I am running on fumes, it is time to say night night! It looks like I have another busy weekend ahead of me, which means there will be little to no chance of napping.